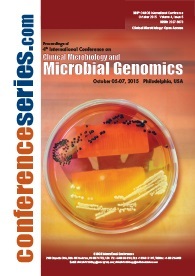 After the success of Clinical Microbiology 2012, Clinical Microbiology 2013 and with the tremendous response of Clinical Microbiology 2014 and Clinical Microbiology 2015 and Clinical Microbiology 2016 and Clinical Microbiology 2017 in October ,Conference Series LLC LTD is glad to announce 9th International conference on Clinical Microbiology during October 08-09, 2018 at Zurich, Switzerland. Conference Series LLC LTD Organises 300 International Conferences Every Year across USA, Europe & Asia with support from 1000 more scientific societies and Publishes 500+ Open access journals which contains over 50000 eminent personalities, 50,000 reputed scientists as editorial board members and 5 million readers. This meeting will focus in particular on the most current research related to the laboratory diagnosis of human and animal infections and the role of the laboratory in both the management of infectious diseases and the elucidation of the epidemiology of infections, the latest developments in clinical microbiology and immunology, providing the current state of knowledge in the field, as well as balanced, thought-provoking perspectives on controversial issues. We invite experts in the field of clinical microbiology including bacteriologist, virologist, molecular microbiologist, infection and quality control clinicians, exercise physicians, yoga practitioners, veterinary microbiologist and delegates from industries focusing on microbiology, molecular genomics and industrialist involved in biomedical research as well. 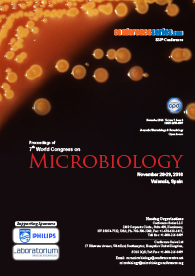 Microbiology-2018 ardently encourages patrons, benefactors, pioneers, and exhibitors from across the world to convene you all to attend and register for the “9th Clinical Microbiology Conference (Clinical Microbiology 2018) which is going to be venerated from October 08-09, 2018 at Zurich, Switzerland. The organizing committee is endowing for a rather stimulating and illuminative conference programs subsuming Plenary Lectures, Symposia, Workshops on a myriad of topics, Poster Presentations and an assortment of programs for participants from over the globe. We invite you to accompany us at the 9th Clinical Microbiology-2018, where you are assured to have a substantially worthwhile experience with ecumenical scholars. All the representatives of Clinical Microbiology-2018 organizing committee look forward to meet you at the congregation at Paris, France. Study of the interaction of the parasite and their hosts is Parasitology. Medical parasitology has it’s congruence with the pathogenic parasites affecting humans, the diseases, clinical pathology and the response of the human’s immune system against these pathogenic Microorganism. It also deals with the different approaches of the infection and diagnosis, treatment, prevention & control. Additionally medical parasitology also comprises of structural based Drug Development, Epidemiological Studies and zoonosis. An interdisciplinary field, inveigled by Biochemistry, Immunology, Microbiology, and other applied life sciences. Parasites inhabit the host of a remarkably high immuno-potent immune system. Vector-borne infections are transferred via bite of an infected arthropod, for instance mosquitoes, ticks, bugs, sandflies and blackflies. Resistant parasitic worms developed resistance against other infectious agents although the mechanisms of resistance in protozoan parasites are not yet acknowledged. About 50% of known positive malarial cases are caused by P. vivax. Prevailing advancements in state-of-the-art diagnostic tools has ascertained new facets for colossal enhancements in parasitic detection. Control and dissolution of human parasitic diseases require innovative outlooks, notably in the fields of diagnostics, modeling, investigation, interpretation, scrutiny and public health response. The Global Animal Healthcare industry was venerated at US $27,861.2 million in 2013 and is envisaged to grow at a CAGR of about 7.1% to achieve an anticipated US $41,929.1 million by 2019. Bacterial diseases constitutes infections whose essential causative organism is bacteria. In bacterial pathogens is the bacteria infects and causes a disease in the host whose cell it invaded in. However, not all bacteria are pathogenic and they have the ability to cause a disease. Bacteria also resides in host without harming it in a symbiotic relation and also helps in building a response against the invading foreign opportunistic bacteria from harming the host. Bacteria primarily produce two types of toxins called the Exotoxins and the Endotoxins. These toxins are soluble can be transported by both blood and lymph and causes cytotoxicity at remote tissue sites. Bacteria also infect skin, causing skin infections like Impetigo, Erysipelas and Cellulitis among numerous others. Urinary Tract Infection (UTIs) are mainly caused by Escherichia coli; Typhoid fever by Salmonella typhi. Bacterial infections are generally treated by antibiotics, which are further categorized as Bactericidal – Antibiotics that kill bacteria and Bacteriostatic – Antibiotics which prevent bacterial growth and hindering their metabolism. Profoundly extensive use of such antibiotics contributes to the swift advancement of the antibiotic resistance in the pathogenic bacterial populations. Antimicrobial agents kill and/or inhibit the growth of microorganisms and are arranged under antibacterial, antiviral, antifungal and antiparasitic depending on their antagonistic character. Antibacterial agents treat bacterial infections and hence are specified as antibacterial, agents that treat viruses are specified as antivirals and agents that are used against fungi and parasites are specified as antifungals and antiparasitics respectively. The toxicity of these agents especially antibacterial agents against humans and analogous animals are quite low. Antimicrobial pesticides benefits the economy by the controlled growth of microbes due to disinfection, reduction of growth thereby protecting various industrial processes, surfaces and water from contamination and spoilage caused by these micro-organisms like bacteria, viruses, fungi, protozoa, algae. Antibacterial antibiotics are categorized as broad-spectrum and/or narrow- spectrum depending on the scope of bacterial infection. Antimicrobial resistance is an indispensable causatum which leads to millions of fatalities annaually. Infections now, are slowly getting untreatable, primarily because of the antimicrobial resistance. All microbes slowly are developing resistance against their microbial agents; like for instance fungi developed antifungal resistance, viruses started attenuating antiviral resistance and protozoa have developed antiprotozoal resistance. Bacterial antibiotic resistance confers a paramount threat of infection non-prevention in multitudes. Antibiotics should solitarily be used only/ if it is indispensable and precisely only when prescribed by a licensed health professional. To prevent or lower the factor of antimicrobial resistance, awareness for using Narrow-spectrum antibiotics should be taught. Antibiotic resistance is quite problematic and various policymakers and pharma industries help in tackllng resistance by supporting various innovative and novel approaches. Microbial biochemistry comprises of biochemical reactions in microbial growth, various modes and mechanisms/ processes of pathogenesis required in causing infection/ diseases in the host. It involves the study of microbial growth, microbial cell structure, microbial metabolism, primary and advanced functions and the interactions of biological macromolecules, like carbohydrates, proteins, Fatty Acids and Lipids and nucleic acids; which cater the skeletal aspect and basis of functions affiliated with life. Biochemical study of microbes is crucial in the processes of their action. Post genomic analyses, maintenance of mechanisms, & functional replication, integrating plasmid functions, conjugation systems and regulatory network are the key factors that play a vital role in metabolism of microbes. When monomers are co-linked to synthesize a polymer, dehydration occurs often resulting in assembly of different macromolecules in a much larger complexes. Infectious diseases are caused by pathogenic microbes which spread either directly or indirectly from one person to another. These can be classified as either bacterial, viral, zoonotic, parasitic or fungal infection depending on causative agents. Most of infections are not lethal and organism is annihilated after the symptoms wane. The process requires immune mechanisms to kill the source of the pathogen. Specific acquired immunity antagonistic to the infectious diseases are mediated by either antibodies or by T lymphocytes. The immune response causes high fever, inflammation, and also has the probability to be devastating to a microbe. Phylodynamic models help in locating the epidemic and pandemic origins. The agile rate of evolution and growth in viruses allows molecular clocks to envisage the genetic sequences, thereby providing the precise rate of evolution of the virus. Health science comprises applied sciences biomedicine, healthcare. Diagnostics methods like primordial physical examination, past medical history and current medical imaging cover the rudiments of first diagnosis of the illness which follow expedited laboratory diagnosis of patient for any serological infectious agents. Health care is provided through a myriad of fields like dentistry, pharmacy, and medicine; also involving treatment and prevention of illnesses. As the resistance of drugs is proving to be herculean challenge, alternative medicine is a boon in a holistic approach. The study of prevention, diagnosis and treatment of various infectious diseases is termed as Medical microbiology. Medical microbiology is the application of all non-pathogenic microbes for improving health and in prevention of epidemics, outbreak of various diseases. Microorganisms commonly causing infections are bacteria, fungi, parasites and viruses and also a viral infectious protein called as a prion. Detailed identification techniques used in laboratories are typically microbial culture followed by microscopy, Electron microscopy and biochemical tests and then genotyping. Medical microbiologists recommend treatment based on the report of a strain of microbe and the prevalent antibiotic resistances, precise site and source of infection, the probable toxicity of drugs and drug allergies. Drug resistance comprises chemically inactivating of a drug or a cell ceasing the uptake of a drug. Clinical Microbiology 2018 is an opportunity or a platform to focus and analyze recent innovations and challenges in the field of Clinical Microbiology and Microbial Genomics. Thus contributing both academicians and business partners to grow and spread their research and products respectively. 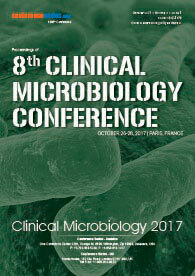 Clinical Microbiolog 2017 welcomes attendees, presenters, and exhibitors from all over the world to October 08-09, 2018 in Zurich, Switzerland. Clinical microbiology is a branch of medicine concerned with the prevention, diagnosis and treatment of infectious diseases caused by four kinds of microorganisms i.e. bacteria, fungi, parasites and viruses. In addition, this field of science studies various clinical applications of microbes for the improvement of health. The Global microbiology market is growing due to increase in prevalence of pathogenic diseases, growth in discovery of mutating and adapting bacterium, and the growing need for speedy microbiological testing methods. In Rome there are 414 researchers and many Societies, Associations are related to Microbiology and Microbial genomics. On the basis of geography, the clinical microbiology, Europe holds the second place in the global market in the field of Clinical Microbiology and microbial genomics. The market growth is expected to reach $ 65 billion by 2024 in Europe. In Europe countries like UK, France, and Germany are possessing good market share in the field of microbiology and infectious diseases. Clinical Microbiology 2017 provides you with an exceptional format to showcase services and the scientific program paves a way to gather visionaries through the research talks and presentations and put forward many thought provoking strategies on Clinical Microbiology 2018. In 1676, Anton van Leeuwenhoek observed bacteria and other microorganisms, using a single-lens microscope of his own design. In 1796, using an ancient Chinese technique for smallpox vaccination, Edward Jenner developed a method using cowpox to successfully immunize a child against smallpox. The same principles are used for developing vaccines today. Following on from this, in 1857 Louis Pasteur also designed vaccines against several diseases such as anthrax, fowl cholera and rabies as well as pasteurization for food preservation. In 1867 Joseph Lister is considered to be the father of antiseptic surgery. By sterilizing the instruments with diluted carbolic acid and using it to clean wounds, post-operative infections were reduced making surgery safer for patients. In the years between 1876-1884 Robert Koch provided much insight into infectious disease. He was one of the first scientists to focus on the isolation of bacteria in pure culture. This gave rise to germ theory, a certain microorganism being responsible for a certain disease. He developed a series of criteria around this that have become known as the Koch's postulates’ major milestone in medical microbiology is the Gram stain. In 1884 Hans Christian Gram developed the method of staining bacteria, to make them more visible and differentiable under a microscope. This technique is widely used today. There are around 50 major universities in Amsterdam: Sapienza - to name a few whose research interest range from the genetic basis of drug resistance in protozoan parasites to the mathematical modeling of helminth transmission within host populations and understanding immune regulation in hosts infected with Leishmania, Toxoplasma, and molecular parasitology in which investigators study drug resistance in toxoplasmosis, gene regulation and understanding basic molecular functioning of parasites to develop new antimicrobial drugs.